On April 26, from 10 a.m. to 2 p.m., the Buffalo County Sherriff’s Office, along with volunteers from Good Samaritan Hospital, Kearney/Holdrege Elk’s Lodge #984, Positive Pressure, and Two Rivers Public Health Department, will give community members their eighth opportunity in three years to prevent medication abuse and theft by ridding their homes of potentially dangerous, expired, unused, and unwanted prescription drugs. Bring your unwanted medicine to Good Samaritan Hospital’s north parking lot at the intersection of 35th Street and A Ave. for safe disposal. The service is free and anonymous, no questions asked. Over 255 pounds of unwanted and unused medication was collected at the October 2013 Prescription Drug Take-Back. Last October, Americans turned in 324 tons (over 647,000 pounds) of prescription drugs at over 4,114 sites operated by the DEA and its thousands of state and local law enforcement partners. At the Buffalo County Take-Back, law enforcement and volunteers collected over 255 pounds of unwanted and unused medication. Over the course of its Take-Back initiative, the DEA and its partners have taken in over 3.4 million pounds—more than 1,700 tons—of pills. 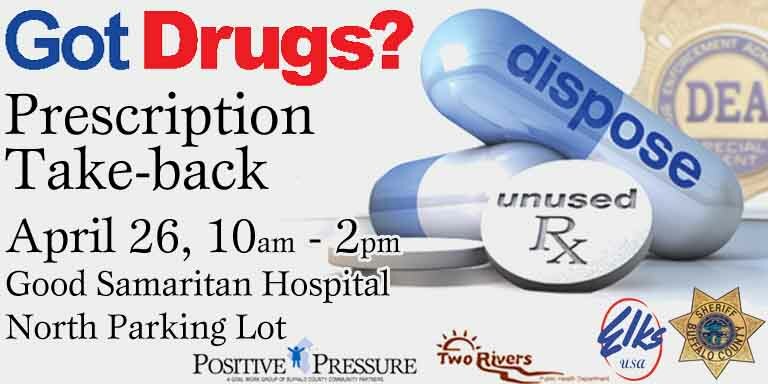 For more information on the Prescription Drug Take-Back, visit positivepressure.org/rxtakeback, join our Facebook event, or contact coalition coordinator Tana Nelsen at 308-865-2283 or by email.